Carne en su jugo translates to ‘Meat in it’s juices’. The result is a simple yet flavorful bowl of beef and broth. 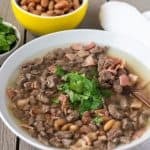 Carne en su jugo is a popular dish in Guadalajara MX, where my husband grew up. There are even restaurants dedicated to making only carne en su jugo. It can be described as a cross between a soup and a stew. It’s served with whole beans and ends up being a pretty filling meal. My mother in law makes carne en su jugo often, and once I saw how easy it is, I was excited to try it on my own. I was able to find all the ingredients at my local grocery store. The only unique ingredient is the tomatillos, but most stores carry them. I used a beef round roast and sliced it into small dices, this was the most time consuming part. Then cut the bacon into similar size pieces as the beef. Tomatillos have a waxy residue once peeled, so be sure to wash well. Everything gets cooked together in one pot, except for the beans. You can either use canned beans for serving or my recipe for Instant Pot Beans. I tried to do a few process shots to give you a better idea on how to make carne en su jugo. 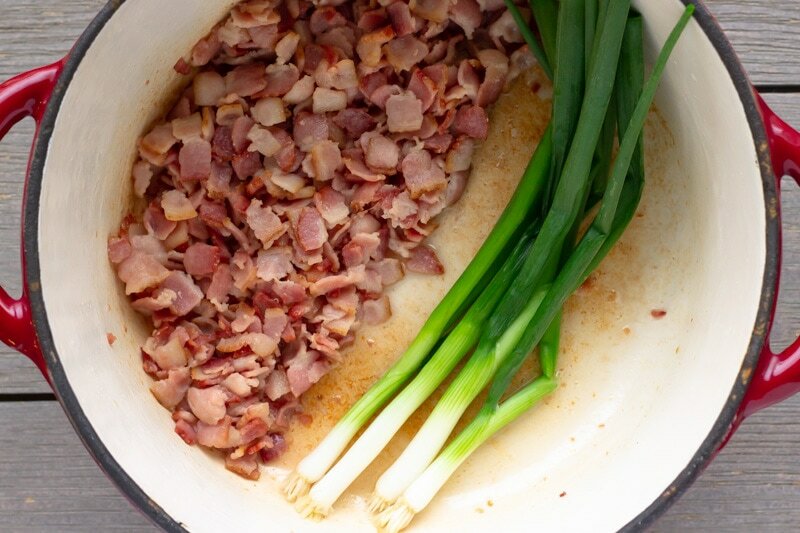 First, you cook the bacon in a large pot or dutch oven, and add the green onions whole and saute in the bacon grease. I know it sounds weird, but you won’t eat the onions, it’s just for flavor. Next, add the diced beef into the same pot with the bacon and the green onions. Cook the beef in all that glorious bacon fat. I added just a bit of salt and pepper to the beef, because the bacon has a lot of salt. Once the beef is cooked, add cilantro stems whole. Again, we won’t eat this cilantro it’s just for flavor. For the tomatillo sauce, place tomatillos and water in a blender and puree till smooth. Then add the sauce to the cooked meat and a little bit more water. Now the soup is ready to simmer. The beef is already cooked, so the simmering is just to develop flavor in the broth. Around 15-20 minutes of a low boil is all it needs. Remove the stems of cilantro and green onion from the soup and discard. Taste the broth for seasoning and add salt/pepper if needed. 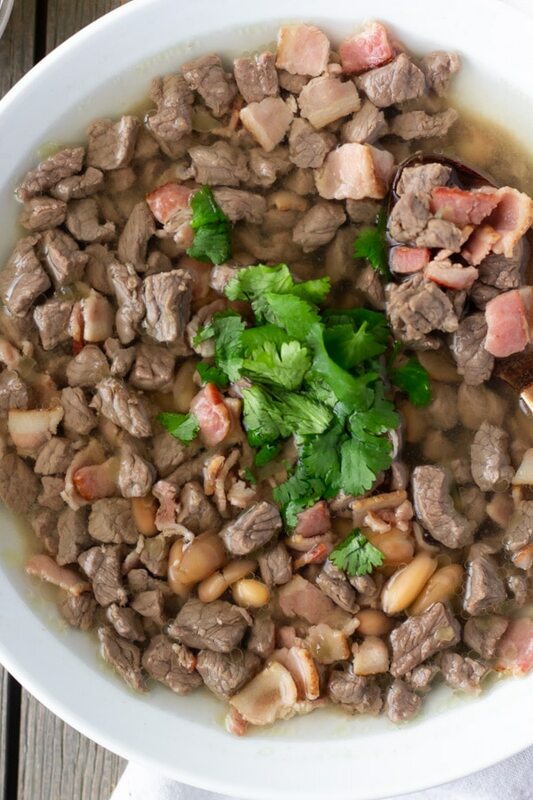 To serve, place a few spoonfuls of beans in a bowl and add the carne en su jugo. Top with chopped cilantro and warm tortillas if desired. 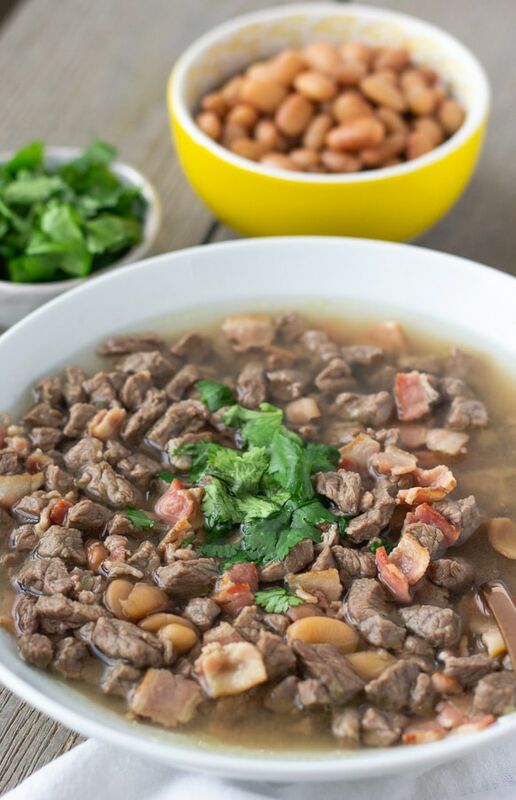 Carne en su jugo is great for a gathering since you can make a big pot all at once. I’m excited to pass down this family recipe and I hope you enjoy too! Carne en su Jugo from Guadalajara, Jalisco. 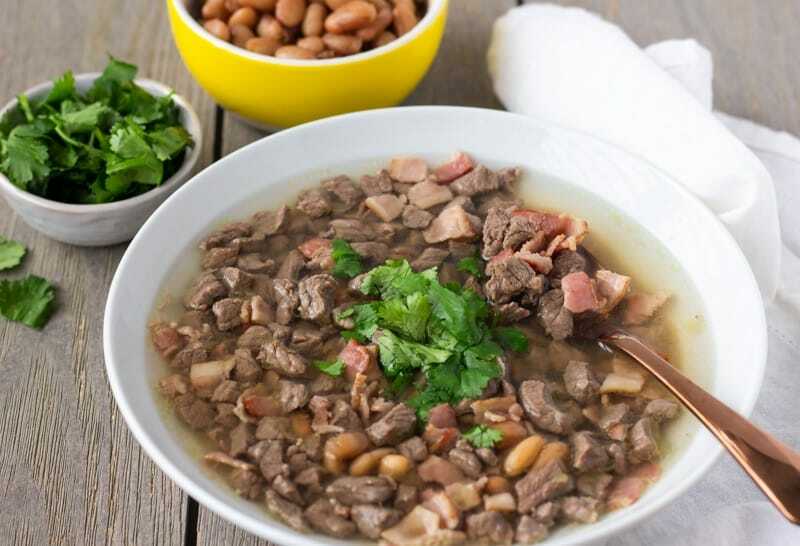 Carne en su jugo translates to 'Meat in it's juices'. The result is a simple yet flavorful bowl of beef and broth. 4-6 cups Water water needs to cover all the meat. Whole Beans and Tortillas for serving. Prep: Slice bacon into small pieces. Slice Beef into similar small dices. Remove husks from tomatillos and wash well to remove waxy residue. Wash Green onions and Cilantro. In a large pot or dutch oven, cook bacon until done. Leave it in the pot and add whole green onions. Cook for about 2 minutes in the bacon grease. You will remove the onions prior to serving, this is just to develop flavor. 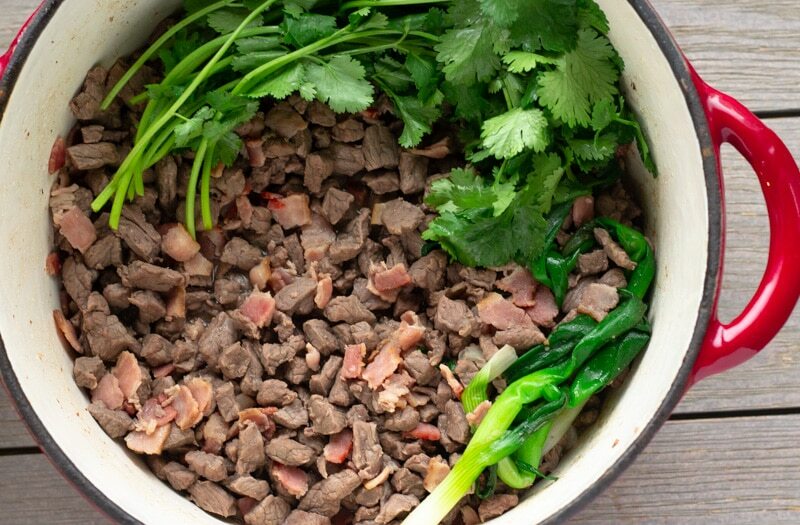 Add diced beef into pot with bacon, bacon fat, and green onions. Cook beef until done. Add some salt to beef. 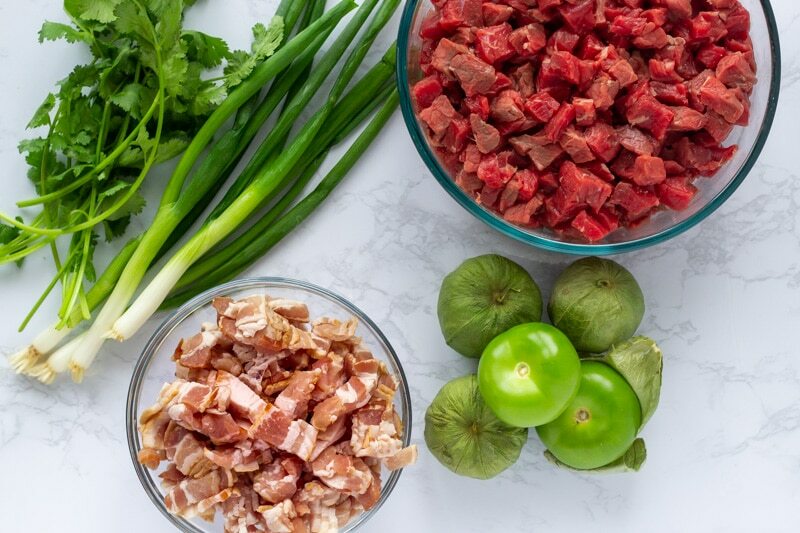 While beef is cooking, place tomatillos, a dash of salt, and 1/4 cup of water into a blender. Blend till smooth. Once beef is cooked, add cilantro (whole), and pour in tomatillo sauce. Add water to cover beef and bring to a boil. Once boiling reduce heat and simmer for about 15-20 minutes. Remove cilantro and green onions from soup. Taste broth and see if additional salt/pepper is needed. 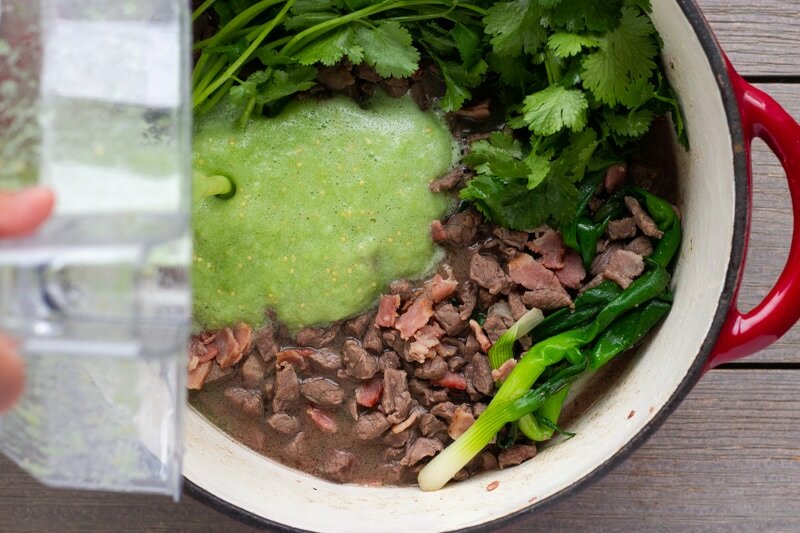 To serve, place a few spoonfuls of beans into a bowl and ladle in the carne en su jugo. Top with chopped cilantro and serve with warm tortillas if desired. You can either use canned whole beans or this recipe for Instant Pot Beans. The broth will have some separation when it sits, that's normal. Just stir well before serving into bowls.